Reading more about the palm oil industry has left me wanting to switch away from products containing this ingredient, or at a minimum, to use only ones that contain palm oil that is sustainably sourced. First on the list to change: bar soap. I like to use bar soap both as hand soap and to wash my face. I know a lot of people are concerned about using bar soap on their face, but it's what I've used for the last several years without issue. Sure, it's not super luxe, but it gets the job done and it's incredibly affordable to boot! 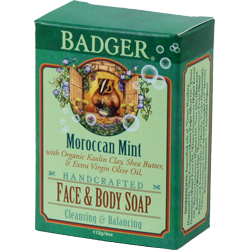 I was excited to stumble across Badger's bar soaps, since before that, I didn't realize the company even made soap. The line is made up of six kinds: three body, one baby, and two face and body. The soaps are made with mainly organic ingredients, and although they do contain palm oil, it is sustainably sourced. I suspect most of the line could be used on your face, but I wanted to try one of the designated face and body bars. I chose Moroccan Mint, which contains kaolin clay and mint and citrus essential oils to help control oil production, and is recommended for normal to slightly oily skin. Mint is usually a pretty safe scent for me and this one is no exception. It smells mostly like spearmint - kind of toothpastey - but it's not an overpowering scent. I haven't noticed any difference in terms of oil production, but then I don't have very oily skin to begin with. At night, I do an oil cleanse first to make sure all my makeup is removed, and then I use the soap, and in the morning, I just cleanse with the bar. It easily creates a rich, creamy lather and leaves my face feeling cleansed but not stripped. After the first couple days I did notice a couple small pimples on my forehead and I almost gave up on the soap entirely, before remembering that kaolin clay is known for drawing out toxins and impurities. My skin has since cleared up and looks better than ever, so I think this was just a brief adjustment period. The bar soaps are pretty unsung compared to Badger's balms and sunscreens, but they're equally great. If you're looking for soap, either for your face, hands, or body, they're definitely worth checking out. I kind of want to try all the other scents now! Good point...it's been so long since I've used synthetic soap, I didn't even think of that! I don't know if we have the whole Badger line in Canada either - I've never seen the soaps in stores here. Those are so cheap! I also didn't know that Badger made soap. I guess I'll have to poke around the health food store a bit more and see if they carry them there. No kidding, palm oil crops up in everything! Thanks for the tip on locations, I'll definitely keep it in mind :) I've ended up having to email a few companies to ask, and once you're asking about their sourcing, I'm always skeptical about how they answer. If they're sourcing sustainable palm oil, I'd think that would be something they're proud of and want to advertise to everyone, without needing to be asked!